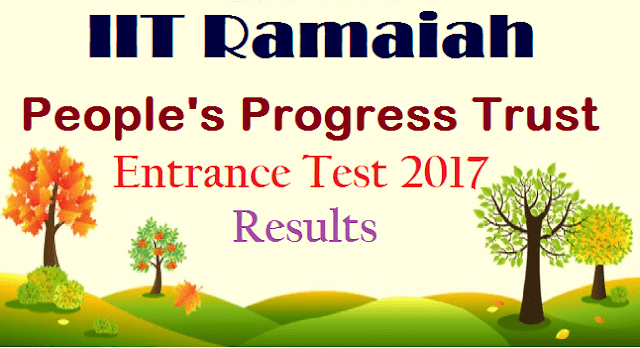 Shri IIT Chukka Ramaiah Peoples Progress Trust Entrance Test 2017 for Economically backward students to achieve Free Higher Education: IIT Ramaiah People's Progress Trust Entrance Test 2017 results are declared on May 27 and district wise selected candidates list are placed on its web portal: http://www.pragathiresults.com/. IIT Ramaiah People's Progress Trust issued the Entrance Test 2017 notification in April month and 5th,6th,7th,8th Class entrance exam was held on May 14. We are releasing the list of Students who secured 60% and above. Final list of students will be selected basing on merit, socio-economic factors and subject to the availability of seats i.e 90 seats per class from this list. About: IIT Shri Chukka Ramaiah Peoples Progress Trust Entrance Test 2017 only for Economically backward students to achieve Free Higher Education. Tags: IIT Ramaiah People's Progress Trust Entrance Testt 2017 Results, IIT Ramaiah People's Progress Trust Entrance Test 2017 Selection list, IIT Ramaiah People's Progress Trust Entrance Test 2017 Results, People's Progress Trust Entrance Test 2017 Final selected list, District wise Progress Trust Entrance Test 2017 Results, Progress Test Entrance Trust 2017 Districts Results. Shri IIT Chukka Ramaiah People's Progress Trust 5th, 6th, 7th, 8th Class Entrance Testt Results.